The "Take It!" was something the likes of which I had never seen before. Many many times our sky is filled with parallel jet trails as we are a major east coast launching point to go west. 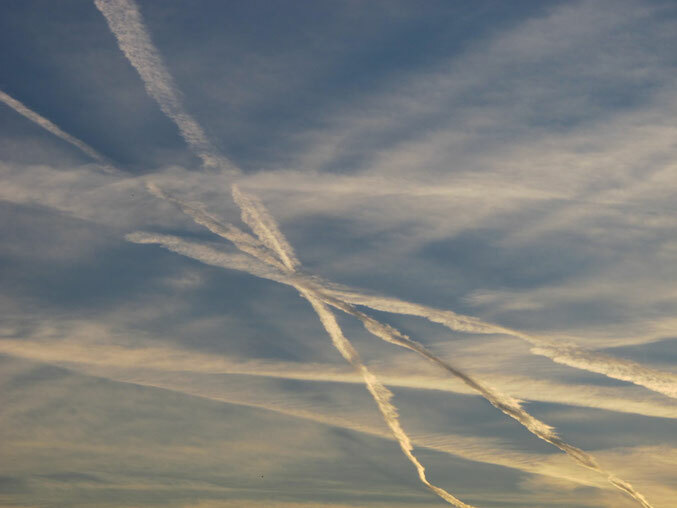 We do see some of the trails that have come from flights on their way to Europe. I have to admit I was so overwhelmed in the viewing of the pattern that my first reaction was to blow my horn and attract the couple that was sitting in their car in a left hand turn lane next to me to show them the awesome view. They were quite taken with it as well. Only then, did I remember my camera. It was a scramble to get it out of my pocket, let alone take this picture through the windshield before the light changed to green. I took another shot and went home, knowing this was going to be a good one to share. The After Take: It seems I am not alone in never having seen this formation. All that I have shown it to marvel at the way the trails are so semetric. The other marvel for all of us, myself included, is that I lucked out in being able to catch it. Several have commented that they like the dynamics of the shot in that it included the tree line as well as the traffic signals full on in red. The entire experience nudged my resolve to try to stay observant, even though it may be the end of the day when the energy level is lower. Wishing you a similar unexpected pleasant view. The sunset really brings out the jet trails.